Murder rate unexpectedly rises in many U.S. cities this year. 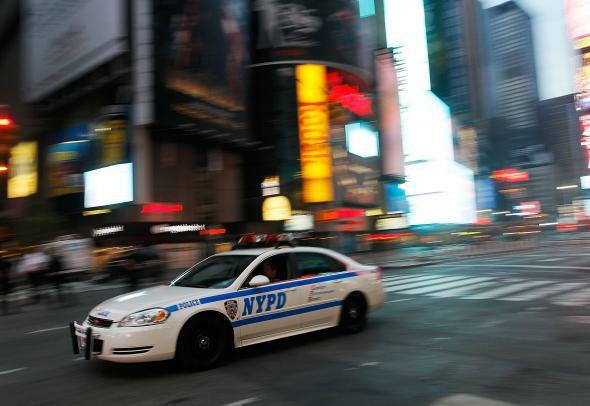 A police cruiser in Times Square May 2, 2010 in New York. [In Milwuakee] 104 people have been killed this year — after 86 homicides in all of 2014. More than 30 other cities have also reported increases in violence from a year ago. In New Orleans, 120 people had been killed by late August, compared with 98 during the same period a year earlier. In Baltimore, homicides had hit 215, up from 138 at the same point in 2014. In Washington, the toll was 105, compared with 73 people a year ago. And in St. Louis, 136 people had been killed this year, a 60 percent rise from the 85 murders the city had by the same time last year. What those numbers add up to, over approximately the same period this year compared to 2014, is: Milwaukee’s murder rate is up 76 percent; St. Louis and Baltimore are both up more than 50 percent; murders in Washington, D.C. are up 44 percent, and Chicago has seen a 20 percent rise. Not all metros have seen a similar trend, as cities like Los Angeles and Newark have remained about the same. New York’s murder rate is up about 9 percent this year.